As this is the first year of the new tests the results look different from those of previous years and cannot be compared with them directly. The new expected standard is higher than the old one. We were seventh place in Portsmouth LA for combined ARE in 2016, up 4 places from 2015 for L4+ combined. We were second in the authority for combined ARE higher standard in 2016, up 2 places from combined L5 in 2015. We are pleased to be able to share with you some very good news about the performance of the school. Results of the tests at the end of Year 6 show that standards continue to significantly improve and attainment is above the national average. 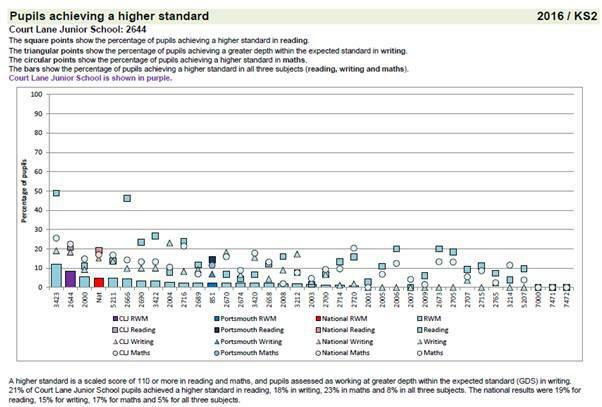 These results show the impact of the improvements the school has been making. We value all of the achievements of our children and academic results are just one measure of success, however we want to congratulate children and staff on these excellent outcomes. The results are included below for your information. Please note that the 2014 national data is still provisional. Our priorities for the next year are to continue to improve the progress made by pupils and to raise standards further in writing. 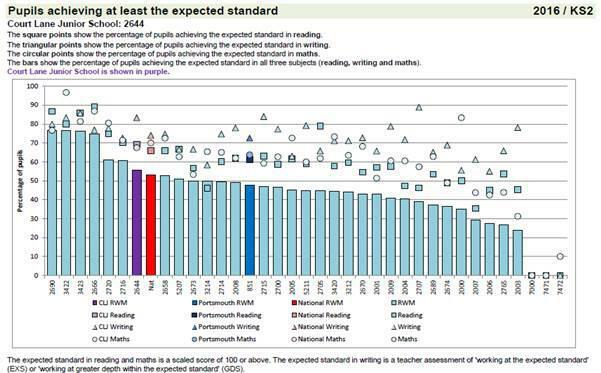 Our current assessments indicate that standards will be even higher at the end of this academic year.